Fjords are formed when a glacier cuts a U-shaped valley by abrasion of the surrounding bedrock. Glacial melting is accompanied by rebound of Earth’s crust as the ice load and eroded sediment is removed in some cases this rebound is faster than sea level rise. Most fjords are deeper than the adjacent sea. Fjords generally have a sill or rise at their mouth caused by the previous glacier’s terminal moraine, in many cases causing extreme currents and large saltwater rapids. CAN YOU DRIVE TO THE MISTY FJORDS NATIONAL MONUMENT? There are no road systems that extend to the Misty Fjords. Access is strictly by floatplane or small boat. A floatplane is an aircraft that utilizes water as its runway with the use of floats or pontoons instead of wheels. This is a popular mode of transportation throughout Southeast Alaska for access to remote locations or communities without a land-based runway. We recommend you book your Misty Fjords tour prior to arrival in Alaska. This guarantees you a tour time that fits into your vacation plans and Cruise Ship schedule. It’s also wise to book your tour for the early part of your stay, this will ensure that you best budget your time in Ketchikan. As far as the best time of the day for a Misty Fjords tour, you should primarily consider your personal schedule. Most of the summer months we are blessed with beautiful flying weather in Ketchikan, and the time of day whether it is in the morning or in the afternoon will make no difference. HOW DO I GET TO YOUR COMPANY LOCATION FROM MY CRUISE SHIP? Our Driver and shuttle bus will rendezvous with your party at the “Rain Gauge” outside of the Ketchikan Visitor’s Bureau. All guests must check-in 30 minutes prior to departure for their flightseeing tour. Our airline Staff Representative at Booth#2 inside the Ketchikan Visitor’s Bureau will assist you during check-in. The shuttle ride takes approximately five minutes from the downtown Cruise Ship Docks to Misty Fjords Air’s Seaplane Facility. WILL WE MISS OUR SHIP IF WE DON'T BOOK WITH THE CRUISE LINES? As an independent traveler don’t be fooled by high-pressure sales tactics from the cruise lines. They will tell many first time travelers to Alaska “If you don’t book with us you might miss your ship” This is far from the truth. In 30 years of flying to the Misty Fjords, none of our guests have ever missed their ship departure. We have active contingency plans in place for all situations. WHAT IS THE DIFFERENCE BETWEEN THE MISTY FJORDS "EXECUTIVE" AND "EXCLUSIVE" TOURS? The Executive is our most popular Misty Fjords Tour that is sold on a per seat basis. The Exclusive is a Private Tour to the Misty Fjords in your own chartered aircraft. Both Tours offer an identical duration and flight itinerary. We recommend suitable waterproof outerwear and comfortable footwear for this excursion. Sunglasses are a must! DO YOU RECOMMEND TAKING AN ANTI-MOTION SICKNESS MEDICATION? If you are particularly prone to motion sickness, taking a precautionary anti-motion sickness medication is a good idea. However, our flights are very smooth and turns are slow and gentle. This is a professional scenic tour, not a thrill ride. Most people do not experience motion sickness and do not need anti-motion sickness medication. Everyone enjoys a (panoramic view) window seat. 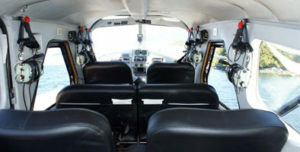 Pictured below is the interior of a DeHavilland Beaver, our mid-sized floatplane. WILL I SEE WILDLIFE ON THIS TOUR? Yes! The Misty Fjords National Monument offers a large variety of game, marine mammals, bird life & wild salmon. There are many photo opportunities and something for everyone! CAN I TAKE PHOTOS FROM THE PLANE? Everyone will have a window seat for fantastic opportunities to take photos. We highly recommend you bring plenty of memory cards and backup batteries. Two important tips are to make sure the flash is OFF to avoid glare from the windows and your camera lens is a minimum of SIX INCHES from the windows to reduce unwanted reflections in each picture. SHOULD I TIP MY PILOT? Tipping is not required. However, should you feel your Pilot or the Staff at Misty Fjords Air provided that extra effort in service, then tips are always appreciated. Whatever your needs may be, we want your trip to be smooth and comfortable. It is helpful for us to know if you require any special services surrounding your flight. You can request many special services via our website or by calling Reservations, where our friendly Staff will be happy to answer any questions you may have. WHAT IF I HAVE A PHYSICAL LIMITATION? Some mobility is required to enter and exit our aircraft. We offer airline Staff assistance during the boarding process. Ramps with handrails allow for smooth loading into the planes. Entrance into the planes requires negotiating two small steps and there is minimal walking required during your stop-over in the Misty Fjords. We are not equipped to handle heavy motorized wheelchairs; however, collapsible chairs are welcome. To assist you throughout your travel itinerary with Misty Fjords Air, we provide courtesy wheelchair services upon request. Our ground shuttle bus and Seaplane Facility are equipped to handle collapsible wheelchairs only. WHAT IF I WEIGH OVER 250LBS? We do not have any weight restrictions per Passenger on our aircraft and no additional charge for Guests over 250lbs. We will discreetly ask for your weight as the FAA requires a full weight and balance record per aircraft. Expect the unexpected! We have experienced “typical” summer days ranging from 50 degrees and raining to 85 degrees and sunny. It is always smart to plan for anything in Alaska. The Tongass National Forest is a 17 million-acre rainforest that makes up much of Southeast Alaska. We Alaskans have learned to appreciate the rain and never let it spoil a good time. If it is otherwise safe and quality flying weather, we will fly in the rain. A little-known fact is that the weather in Ketchikan and Misty Fjords can often be very different. Ketchikan is on an island located very close to the open ocean as Misty Fjords is located on the mainland 40 miles in the opposite direction. Misty Fjords experiences less rain than our coastal area near Ketchikan. Our Seaplane Captains are experts in the decision-making process when it comes to weather. The safety of our Passengers is our number one priority. We will not fly if it is not safe. Our second priority is tour quality, and we won’t fly if tour quality is poor. HOW DO YOU PROCESS TICKET REFUNDS? We will process your refund request quickly. All tickets will be refunded in full to the original form of payment within the first 24 hours after their initial purchase. Misty Fjords Air is Ketchikan, Alaska’s premiere Seaplane Company, providing on-demand charter service to Southeast Alaska and the first company to fly regular tours into the Misty Fjords National Monument. 1 Prices listed on this website are subject to change without notice. 2 This institution is an equal opportunity employer. 3 Unauthorized use of any image on this website is prohibited.